Patrick Maroteaux, the highly admired owner of Château Branaire–Ducru, and one of the truly great men of French wine, died on November 19, at just 67. Our thoughts and prayers at Vinous are with his lovely wife Evelyne and his children Sophie, Anne-Laure, Pierre-Henry and François-Xavier. Patrick Maroteaux embodied all the qualities of Bordeaux’s best people. Born on 25 June 1950 in La Ville-aux-Bois-lès-Dizy, Maroteaux travelled through life hand in hand with success. Always a smile on his face, Maroteaux had not one career, but three, each time leaving a lasting mark of charm, kindness, class, and impeccable manners. 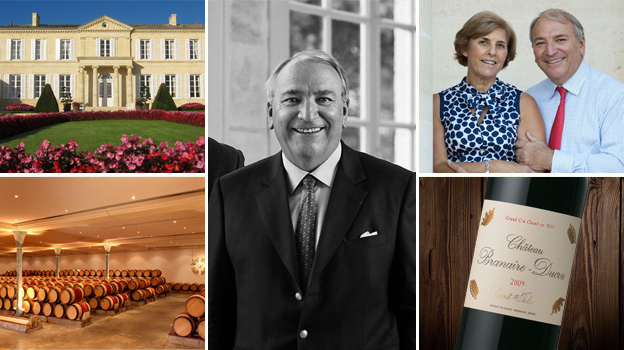 First it was the banking industry, then as head of sugar producer Eurosucre, and finally, as owner of Château Branaire-Ducru, a Fourth Growth Bordeaux estate in Saint-Julien. Maroteaux moved full-time to Saint-Julien in 2000 and surrounded himself with talented individuals such as winemakers Philippe Dhalluin (now technical director of Château Mouton Rothschild) and, later, Jean-Dominique Videau. He instituted drastic yield reduction, built a gravity-fed winery in 1991 (the first in the Médoc), and introduced a second wine, all while speaking of his peers with the greatest reverence and admiration. A tireless ambassador for the great wines of Bordeaux, Maroteaux served two terms as President of the Union des Grands Crus de Bordeaux, or UGCB. During the years of his presidency, the UGCB doubled its number of international operations and started highly successful consumer-focused initiatives such as the Weekend des Grands Amateurs in Bordeaux. At one time, he was also president of the Saint-Julien appellation. I started visiting Branaire-Ducru regularly in 2000. As a wine writer, I was (perhaps) well known in Italy, but internationally, I was nobody. Yet on my very first visit to Branaire, Maroteaux made me feel like I was Hugh Johnson. Over the years, I was fortunate enough to get to know his lovely wife Evelyne, his children, and their spouses well. I have not allowed that to happen often. When I invite people I especially care about to dinner, I open a Branaire-Ducru wine. The secret of Maroteaux’s success in life? One day while strolling from the Gironde river’s edge through the vineyards of Beychevelle and Ducru-Beaucaillou back towards those of Branaire, he suddenly stopped in mid-conversation and excitedly ran to a spot to show me precisely where the soil was changing: “You see this gravel Ian?” he asked excitedly, is voice almost shaking. “This is what helps make a second growth such as Ducru. What we need to do in Bordeaux is just let our land speak in our wines”. To observe an important and successful businessman get genuinely so excited over a small piece of change in dirt is a curious feeling, and one that explains more about Maroteaux and his passion than anything I could write. Patrick Maroteaux left a mark on my life. I consider myself blessed to have met him.